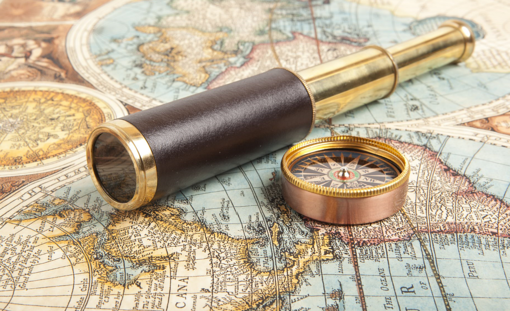 Those first few thousand years were mostly dedicated to adventure and defense, but the historical time period coined The Age of Discovery which spanned the 1400s is the dawn of fleet management as we know it today. Although international maritime trade was already in use, The Age of Discovery kicked off when European shipping companies needed to identify new routes to avoid areas of growing conflict and, as a result, also discovered new lands. International trade increased from Europe, Asia, and Africa to include previously untapped North and South America. As news of The New World and new shipping routes became known, maritime shipping traffic expanded exponentially for the time but, since radio signals had yet to be invented, tracking and communication among ships relied entirely on person-to-person contact. And the odd carrier pigeon. In the 1800s Semaphor signals – a series of waving flags or flickering lights akin to Morse Code – made way for, well, Morse Code which was made useable for seafarers by the discovery of radio signals. It’s an impressive feat in 400 years to go from sending a rowboat ashore announcing a port call to harnessing the power of radio frequency. Comparatively soon afterwards, in the 1950s, satellite signals were born. As electronic technology continued to progress and trains, planes, and automobiles became the standard, international reliance on maritime shipping slowed, but never stopped because it was, and continues to be, the most cost-effective mode of shipping. But as communication technology in general advanced, maritime shipping companies concentrated technology advancements into ship design to create fleets that can carry more freight, faster than ever causing as little harm to the environment as possible. While innovation in shipbuilding continues to grow, focus on communication has only just begun, which is what makes exactEarth customers industry leaders. Mandated AIS transponders provide a vessel’s location, not a complete picture of the voyage as it’s happening. Our dynamic data service can not only enhance safety measures and aid in environmental protection, but our satellite tracking enhances business operations by providing vital information about your entire fleet, any surrounding ships, and international waters at the click of a button. Track shipments, drop-offs and make accurate port calls to boost convenience and efficiency for all parties and launch your next shipment in short order. Save on fuel and gain time while effortlessly avoiding MPAs and potentially dangerous situations for your entire fleet in real-time. Get on board with real-time data now and discover the benefits of our incoming exactView RT data service as it happens. For more information on exactView RT powered by Harris, visit our webapge.